Happy Monday readers, I’m happy to officially introduce myself as the new Managing Editor for PoliticsPA. I’m very excited to have this incredible opportunity in truly fascinating political times. PoliticsPA is at its best when they are keeping the political fanatics in the state well informed on stories affecting Harrisburg, Washington D.C., and communities across the state. I look forward to getting to know you all, and I want to share a bit about my background. I come to the role from my recent work as a reporter for my local newspaper, the Northeast Times. It was a tremendous opportunity to cover neighborhoods and civic associations to see what my neighbors care about most. I’ve also kept the pulse of state and national political issues as a producer and board operator at Philly’s Talk Radio 1210 WPHT. (I continue to work there on a part time basis). I contributed to PoliticsPA during my final semester at Temple and couldn’t be happier to lead the website now. I’m a Northeast Philly kid through and through (my mom was a Catholic school teacher and my dad is a cop). I graduated with a degree in Journalism from Temple University, while minoring in Geography and Urban Studies. My passion for covering Pennsylvania’s political scene dates back years, along with my appreciation for the work that journalists do to keep citizens in the light and well-informed. 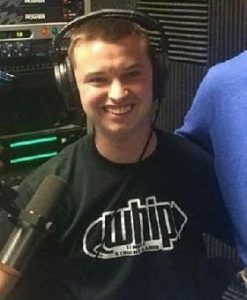 While I was a Journalism student at Temple University, I was an on air talk show host covering sports (Go Birds) and politics for WHIP Radio. The biggest thrills of my past reporting include the 2016 election, and broadcasting Temple basketball and football games for WHIP Radio. During the 2016 cycle I had the pleasure of interviewing countless informative guests from the Journalism field such as former Secretary of State Madeleine Albright, PoliticsPA alum Robert Costa, and numerous elected officials. Not only did I spend a great deal of time behind the microphone, it was important to me to go out and cover events on the ground. I covered multiple Hillary Clinton rallies in Philadelphia, Bernie Sanders’ visit to Temple University, Sen. Pat Toomey and Katie McGinty’s Senate debate, and a rally for Donald Trump. These experiences only furthered my desire to pursue a career in journalism. I’m very much excited for the opportunity to lead PoliticsPA and hope to continue to provide quality coverage to the avid readers of the site. It’s my job to be up to date on the latest political news impacting Pennsylvanians and want to develop a rapport with readers and newsmakers alike. It’s my goal to provide accurate, interesting coverage. I welcome your suggestions for how to do that. Everyone should feel free to reach me at any time at John@PoliticsPA.com. I want to thank PoliticsPA’s owners and all my predecessors, especially Paul Engelkemier, for giving me the opportunity to contribute to the PA’s political conversation. Finally, I want to thank you for reading. I look forward to this new chapter. Congratulations John. You learned from one of the best political journalist in the state,Tom Waring. Best of luck, John. I wish you well in your new role. Congratulations John. Give us some good balanced coverage for us to attack each other about!